I’m not the world’s most organised person. Left to my own devices, I’m forgetful and scatty, and the sort of person who can only remember trivial things from decades ago, rather than important stuff that needs doing now. Therefore, I need some tools to help me remember everything, and my current weapon of choice is the Filofax. I had to retire one recently as it had got quite shabby, as had the contents, so I went on a hunt for a new one. Although there’s quite a wide selection available in shops such as Office Outlet, Rymans and WHSmith, I couldn’t find one that I liked at all. I’m not normally bothered about such things, but they were all a bit to feminine for my liking – all pastel colours, flowers and sparkles. 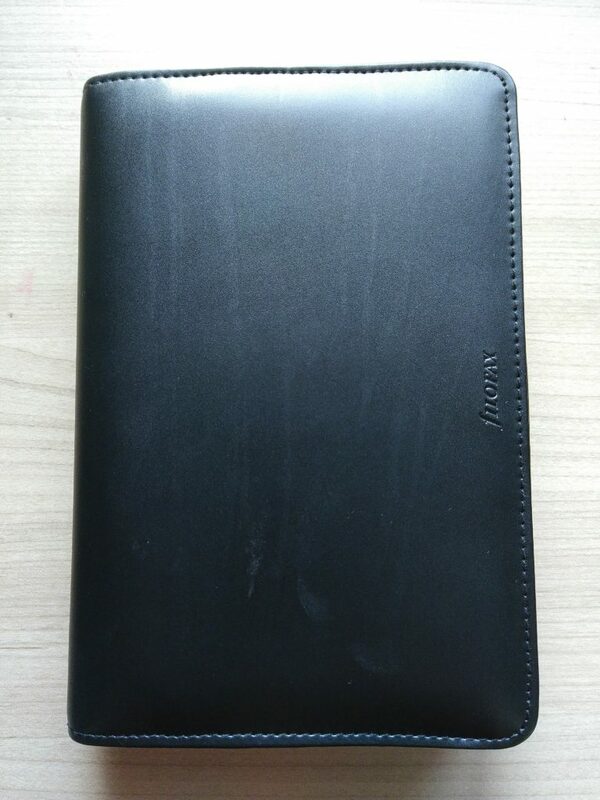 I wanted something plain and black, and for that I had to visit the Filofax website, where I obtained the Metropol Zip Personal – plain, black and unassuming. It does make me wonder if the ones more readily available are indicative of the Filofax key demographic – maybe they’re aiming the product more at women these days. Getting hold of one of these is always fun. The reason I like them is the fantastic level of customisation available – you can organise them exactly how you want. Far more flexible than bound paper diaries, and even more so than organising your life electronically. I know the smartphone has been sold to us as the ultimate organising tool, but I’ve yet to find any apps, on Android at least, that come anywhere near the job of organising me as well as this. Although there’s plenty of agenda/diary and to-do apps available, I’ve never enjoyed using them or found them customisable enough. I’m actually of the opinion that only the Psion Agenda app, as found on the Series 3 and Series 5 computers of the nineties, is anywhere near flexible enough for my needs, with fantastic integration with other apps on the device, but sadly those machines are now rare, unreliable and difficult to use on an everyday basis, so back to paper it is. I like using the diary as the main focus of everything, filing notes and other things, like day planners, in amongst the entries as required. Section 2 is my to-do list, and Section 3 organises my penpal letter-writing. There’s room for just about everything I need in here. Lists, thoughts, notes, appointments, things I need to do, random geocaching co-ordinates, even space to tuck Instax and Polaroid photos I shoot while I’m out and about. 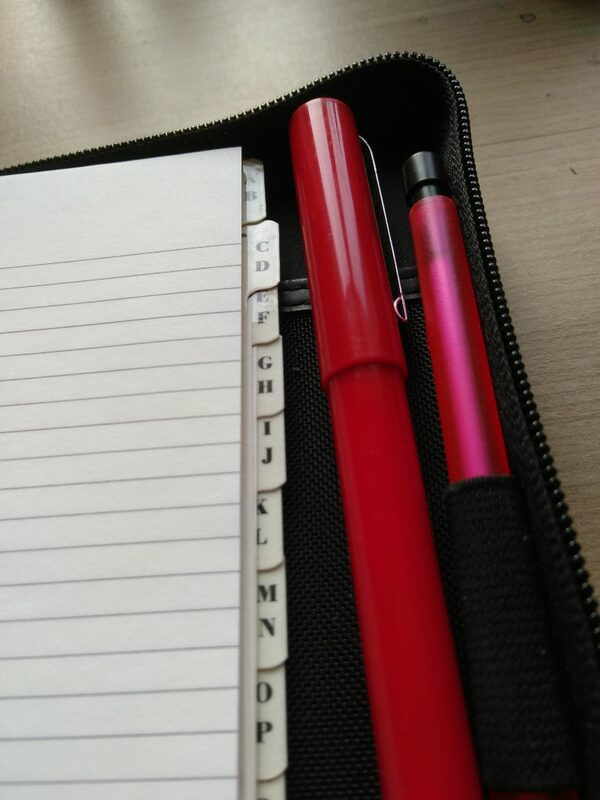 This one is big enough to squeeze letters and other important bits of paper into as well, and the zip around the outside keeps everything well-protected and dry. The whole thing sits in my backpack perfectly, and goes anywhere. 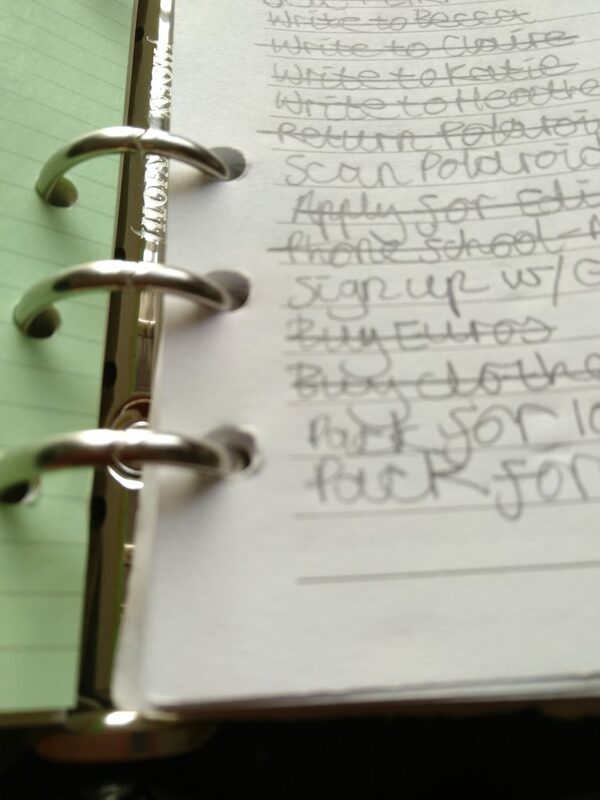 Using it is a very enjoyable and tactile experience, far more fun that tapping away on a phone, and you can keep and archive the contents for as long as you want – my old and slightly battered Filofax is going to have a peaceful retirement as a home-based archive for things I want to keep. I don’t see many people using these any more, and they’re clearly less popular than they once were – I assume a lot of that is to do with the smartphone and tablet onslaught. 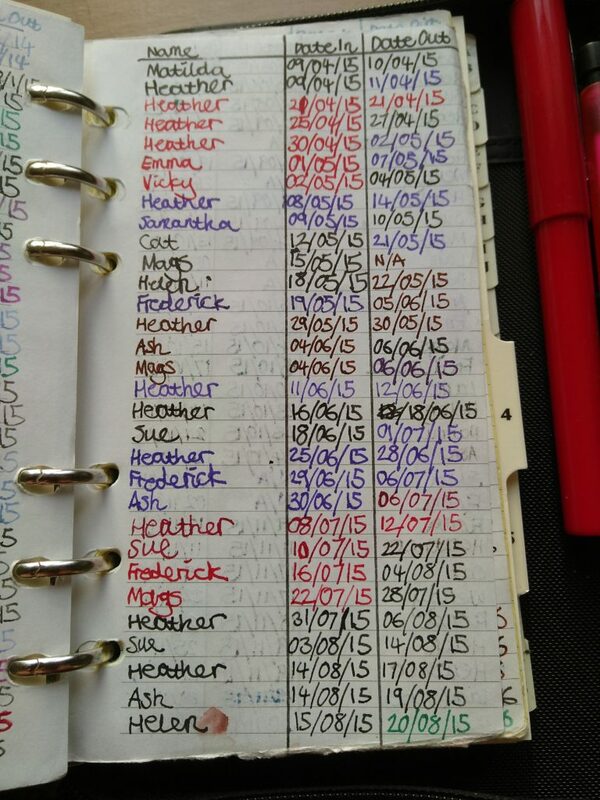 A lot of people organise their diaries, for work at least, using collaborative online tools, and carrying something like this around might feel like unnecessary duplication. It’s not a problem for me, given that my job is desk-based in one location, and with very secure IT systems – I organise my work life at work, and this is for the stuff I do when I’m not working. I suppose Filofax took bit of a blow in the eighties, when they were associated with all the worst excesses of Yuppie culture. They go with over-the-top cocktails, red braces, big specs and bad hair, along with the penthouse apartment in Docklands and the Ferrari. I’ve already written about the guy in the Halifax Cardcash ad – I bet he had a Filofax. Even Del Boy had one for a while, along with a housebrick mobile phone. This, I suppose, officially made them “naff”, but I don’t really care. They appeal to my love of simple, practical things that just work, and I’m glad you can still get them. Do you have one? What do you like about it, and how do you use it? I picked up a secondhand filofax for about $5 last year – it was still in its original box and everything! It seems to be from the mid-nineties and it’s a classic black leather affair. It was too late last year to justify buying refills, but I’m planning to get some this year once my pay starts coming through from work. I’m hoping it will help with organising myself and providing a place to jot notes and other creative things. I think for creative people who like to note things down, they’re brilliant things and are really practical. I find it’s great for organising notes chronologically. 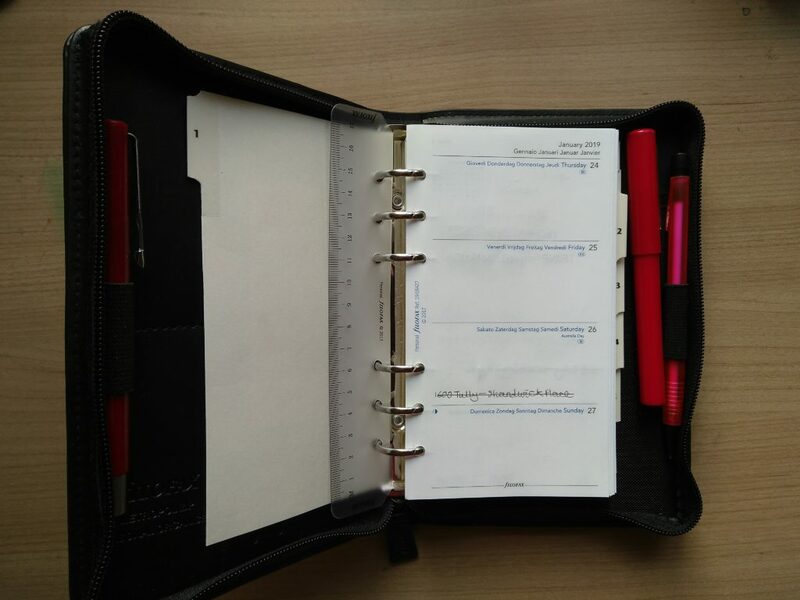 I still find notebooks better for certain things, but for making sure I don’t forget essential things, I love my Filofax.